The University of New Mexico will honor philanthropists Diana and Chester French Stewart with Honorary Degrees at the 2018 commencement ceremony Friday, Dec. 14 at 6 p.m. in Dreamstyle Arena. 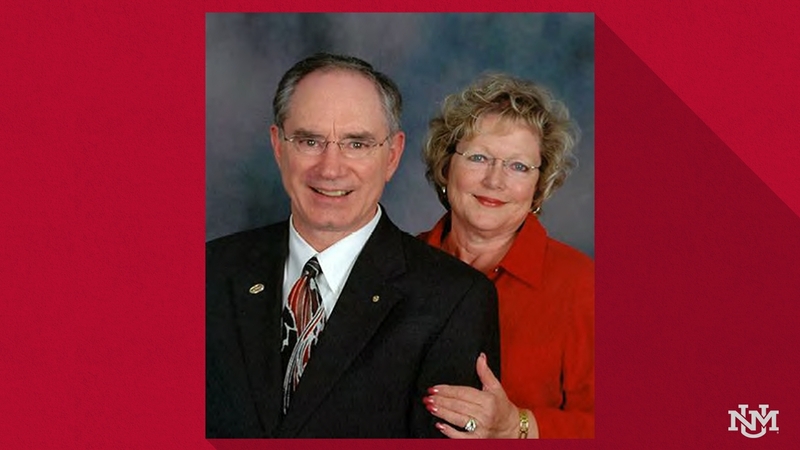 The French-Stewarts will receive the Doctor of Humane Letters Honorary Degree. The University of New Mexico recognizes individuals by awarding special honors to those persons who have contributed significantly to the cultural or scientific development of the Southwest, or to the spiritual or material welfare of its people. Together, through their philanthropy, the French-Stewart family represents the best of Albuquerque, New Mexico and the Land of Enchantment locally and nationally. They provide an outstanding example for all Lobos of what a culture of philanthropy truly means through their wide-ranging support of so many areas throughout the University over the decades. Well-known for their ownership and management of French Funerals and Cremation Services and Urn Gardens/Cemeteries, the French-Stewarts philanthropy and leadership development in Albuquerque have benefitted both UNM and Central New Mexico Community College. They continually give back to UNM whether it is on a large scale including endowments and scholarships or through smaller efforts like personal assistance and sponsorships. Through their personal assistance, the Stewart’s have provided assistance to numerous individuals with housing, financial support and encouragement. Annually, they sponsor 10 people to attend the Global Leadership Summit in Chicago and continue mentoring these individuals locally and nationally. In addition, the French-Stewarts are members of dozens of boards and are generous donors to several charitable and assistance foundations in Albuquerque and New Mexico. Chester F. Stewart relocated to New Mexico as a young man to apprentice in his grandfather’s (Chester T. Stewart) funeral services company. The elder Chester died unexpectedly shortly after the younger Chester arrived after completing mortuary science school. It was at this time that Chester had decided to stay in New Mexico. At the time, Diana was already in New Mexico and had graduated from UNM. Together, they have four sons, three of which are UNM graduates. The French-Stewarts will join an impressive group of Honorary Degree recipients dating back nearly 100 years to 1924. For a complete list, visit Honorary Degree recipients.